Sorry, this product is not currently available for sale. Kapustin's Trio for flute, cello and piano, op 86 was, at the time of its composition in 1998, the composer's first chamber composition, with piano, for more than two players. It has since proved to be one of his more popular works, with its energetic, jazzy opening movement, languid Andante and joyous finale, and much of its attractiveness lies in the equal treatment Kapustin gives to each player. The work was given its UK premiere at the Shaw Theatre, London, in February 2006 to much critical acclaim. 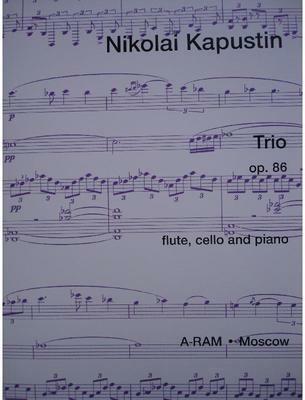 Contact us if you'd like to be notified when Trio op 86 by Nikolai Kapustin is next available. What do you want to know about Trio op 86 by Nikolai Kapustin?